Depends on what your definition of true is. Is your "truth" actually a stereotype? Is your "truth" an obvious, low-blow joke? When are we going to stop tearing down people for comedic purposes? I feel like I have a great sense of humor, and that I can take the heat when it comes to jokes about myself. But at what point will we realize that commenting on somebody's looks isn't doing anything for society? Seems like common sense. Growing up, I was raised not to judge a person on how they looked — that it was not in good taste to comment negatively on someone's hair, skin, etc. Further, I was taught to see the person inside the body. Who are they? How do they treat others? What do they stand for? I can't imagine talking negatively about a person on national television, and then having to face them. Because regardless of what anyone says, it hurts when someone makes fun of how you look. You can brush it off and master the art of not caring, but deep down, you take offense. You probably won't forget it, either. Clearly, this post comes after Giuliana Rancic's recent comments. I think Giuliana is a talented, professional television presenter. She's also a journalist, having graduated with a Masters from American and serves as managing editor of E! in addition to her hosting duties. I do not like watching red carpets without her, because it is a true skill to create an entertaining live show, and she has that "it" factor many hosts don't possess. That being said, I have always been somewhat confused about her involvement with Fashion Police. Initially, she was there to moderate, and that made sense. But it gets dicey when you jump into critiquing as well, given she probably has or will have to interview the people they commentate on the show. What Giuliana said about Zendaya was insensitive and stereotypical. Do I think G is a racist? No. I think she got caught up in the spirit of the show, which is to poke fun at celebrity's looks, and might have thought she was making an obvious joke. I don't think we should turn a blind eye to these things — clearly, this is an issue that needs to be addressed, given it was said, but also, it wasn't edited out of the final product. This went through many people before airing on E! But I also know people make mistakes. It's hard to be a journalist, because you are held to a higher standard than others. You are not allowed to be incorrect as a journalist — it has ruined careers. People aren't as quick to forgive journalists, and I empathize with her on this. Joan Rivers, above all, was a comedian. I have seen her say worse on that show, so it's not hard for me to think that if she had said it, people wouldn't think twice about it. Am I disappointed? Yes. Do I think she's a hack that needs to quit her job? No. Back to the big picture: I love when people are real and authentic, but I also think that being kind and polite is a lost art form. Everyone feels compelled to say whatever they want, to whomever they want. Having the control to bite your tongue and not spit out everything you think is a gift these days. As a woman, I hope that we can all realize that railing on a person for having a grey hair, getting a blemish, getting cosmetic enhancements, gaining weight, or wearing a makeup look or dress that isn't flattering isn't conducive to moving society in a positive direction. We are not one photo, one bad hair day, one bad work day, etc. We are not one day of our lives. We are what we stand for, how we treat others, how we react to situations; what message we spread to the world. 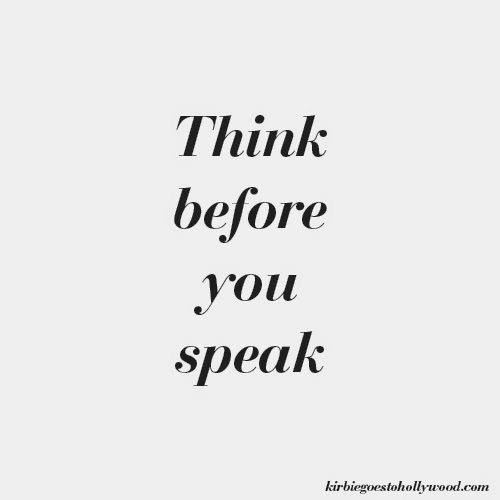 Think about that the next time you feel compelled to comment on someone else's looks, and when you feel compelled to comment on somebody else's shortcomings. TL;DR: have empathy and think before you speak.